Revisiting DOCTOR WHO AND THE SILURIANS | Warped Factor - Words in the Key of Geek. 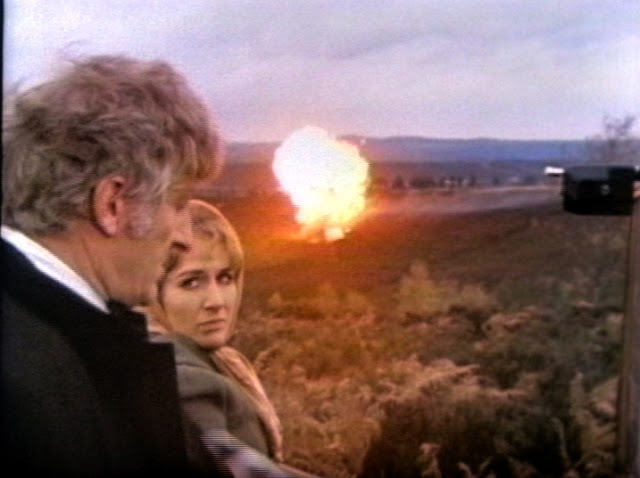 Spearhead From Space might be remembered as the story that firmly established the Earthbound, exiled to Earth format of much of the third Doctor era, but it was those stories of Pertwee's first season that really began to show what that format both was capable and incapable of. As early as the second story, Doctor Who And The Silurians, the first of the season's seven-part adventures, it was evident that the production team where already finding new ways of tackling something that was being seen a possible shortcoming of the new format. According to an oft told anecdote of script editor Terrence Dicks, its writer Malcolm Hulke pointed out to him that the series was now limited to two types of stories: alien invasion or mad scientist. Realizing there was some truth to this, Dicks conceived of the idea at the heart of Silurians: the aliens have been here all along. 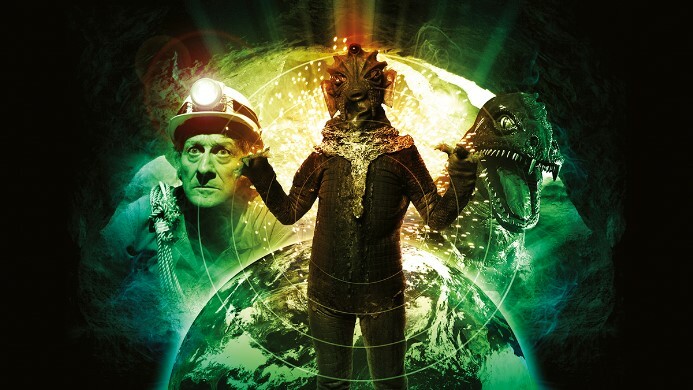 Silurians is not an invasion from outer space, but an invasion from beneath our feet. In fact the alien invasion of Silurians could work either way. The Silurians themselves are the former dominate species of the Earth who, after millions of years in hibernation after an anticipated catastrophe that never came, have awakened to discover that the Earth has been overrun by the descendants of primitive Apes from their own time. The question in turn is: whose planet is it anyway? With battles both within and between the two races plus a plague sub-plot in the latter part of the story, Silurians is a wonderfully morally ambiguous tale, with the Doctor trying to avert an all-out war between humanity and the Silurians as tensions build between the two species, as he deals with some of the worst aspects of both. Silurians is about ego as much as it is about that invasion. Throughout the entire story, we meet characters on both sides who put their own egos and ambitions before everything else, no matter the cost. On the human side we have Dr Quinn, Dr Lawrence and Major Baker. Dr Quinn wants to use the Silurians scientific knowledge to further his own career and reputation, Dr Lawrence sees the research center in much the same way Quinn sees the Silurians scientific knowledge, and Major Baker sees the crisis going on at the center as a way of making up for a mistake in his past. On the Silurians side we see the Young Silurian killing off his leader, who was willing to at least attempt to live in peace with humanity, as a way of grabbing power for himself as well as the best way for his own race to take the Earth for themselves. The results of all their egos isn't success for any of them but death. 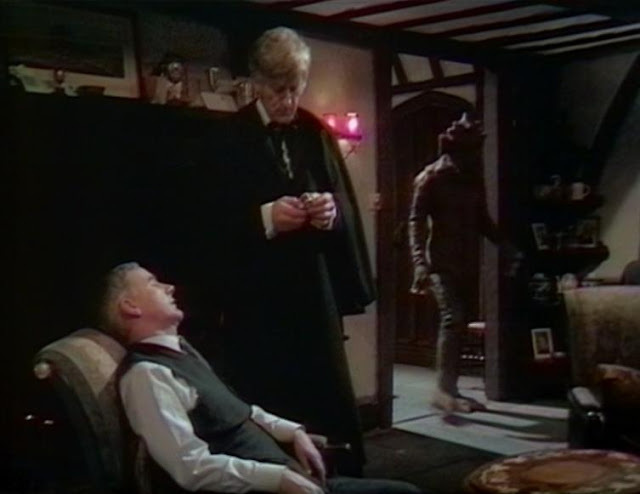 The story, and indeed its conclusion, highlights for the first time something that was to become a theme throughout much of the Pertwee era's UNIT adventures: the conflicts between the Doctor and UNIT. The Doctor spends much of the story wading through egos trying to make peace between everyone until that proves almost impossible. Yet the story heads in a direction that suggests that a peaceful answer to the situation might still be possible. The final minutes though see UNIT and Brigadier Lethbridge-Stewart choosing to seal away the Silurians, effectively killing them forever. The Doctor, and indeed Liz, look on in horror from a nearby hill. The dialogue of that scene is itself an alteration suggested by Letts upon reading Hulke's script. Hulke's 1974 novelization of the story (retitled The Cave Monsters) uses the original ending, which has the Doctor lamenting the loss of the Silurians scientific knowledge as a consequence. The TV version ends with the Doctor pointing out a more important fact: the Brigadier's actions are “cold blooded murder.” It seems clear which ending is the better one. All of this is helped by some wonderful performances. Pertwee, having already firmly established his Doctor in Spearhead, really comes into his own here as he butts heads with virtually everyone, friend and foe alike. Nicholas Courtney's Brigadier comes across well himself as he deals with what starts out as a routine security matter and quickly descends into ever growing chaos. Caroline John's Liz Shaw, who even here is already beginning to be sidelined, also comes across well and gets a couple of especially good moments in the middle and latter parts of the story. The real stars though might be the supporting cast who, blessed with Hulke's excellent script, get the chance to shine, including Fulton Mackay's Dr Quinn, Peter Miles as Dr Lawrence, Thomasine Heiner as Miss Dawson and Geoffrey Palmer as Permanent Undersecretary Masters. The result is one of the best cast stories in all of the Pertwee era. That's not forgetting the titular creatures. While Classic Who is often accused of featuring men in rubber suits, this is one of the times where that criticism is unfair, to say the least. Yes the Silurians are men in suits but they're well designed suits, creating something that could conceivably be a bipedal reptilian creature. 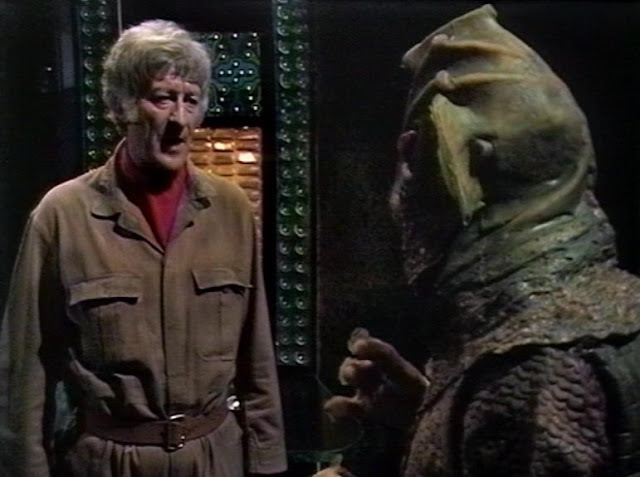 The suits themselves work in the scenes set in the caves and the Silurians lair where they're often seen in less than optimal lighting conditions. Where they are perhaps let down is when they're seen in bright lighting, such as in the research establishment towards the story's end. For the most part though, and especially when combined with the voices created by actor Peter Halliday, the Silurians are one of the most effective creatures in all of Classic Who. Despite a title that fell in the cracks between the outgoing production team and the new one coming in, Pertwee's second story remains one of the best from his era. While it sets up the formula used in more than a few other stories, of strange happenings at a British government funded scientific establishment seeing UNIT (and in turn the Doctor) being called in, few others would have quite as much success as writer Malcolm Hulke did here. Hulke's script uses all of its seven episodes to great effect in helping to flesh out the characters, their motives and the effect they ultimately have upon events. The story fleshes out the Silurians as well, making them amongst the more three dimensional “monsters” of the Pertwee era. The result is seven fantastic episodes and one of the best stories Doctor Who produced in its original twenty-six year run.